‘Gentlemen, we are to storm and carry the enemy’s works on Lookout. You will of course whip the enemy, and then we will all assemble at my quarters and take a drink’ (1). So said Brigadier-General Walter C. Whitaker to his troops shortly before 9am on 24th November 1863, as they prepared to assault the Confederate positions on Lookout Mountain. The daunting eminence, 729m in height, formed part of the Rebel line which overlooked the Army of Cumberland’s positions in Chattanooga. 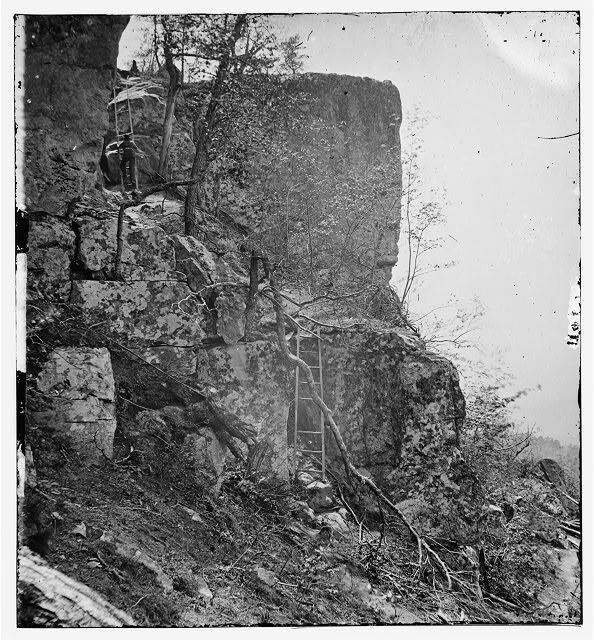 Having just crossed Lookout Creek that morning, Whitaker and his men were among the troops charged with engaging Carter L. Stevenson’s Confederates, and if practicable they were to secure the mountain. Amongst Whitaker’s Brigade were the 168 officers and men of the 35th Indiana Infantry. 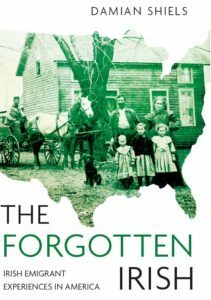 The unit was also known as the ‘1st Irish Regiment’ and was under the command of Irish-American Colonel Bernard F. Mullen. Many of the men would still have worn their distinctive green kepis that they had been issued with to distinguish them as an Irish unit in 1861. The task facing the Irish Hoosier’s was not lost on Colonel Mullen. Having crossed the creek and formed line of battle on the centre-right of the Brigade’s first line he began to realise the challenges he faced: ‘Now for the first time I understood our business to be to sweep the Lookout Valley and carry the enemy’s works on the mountain by storm. The route across the spurs of the mountain was exceedingly rough, deep gorges, rugged ascents, and sharp projecting rocks rendering the march toilsome and tedious’. The Irishmen set off and eventually found themselves advancing along a ledge known as the ‘bench’ which skirted the mountain about two-thirds of the way to the summit. 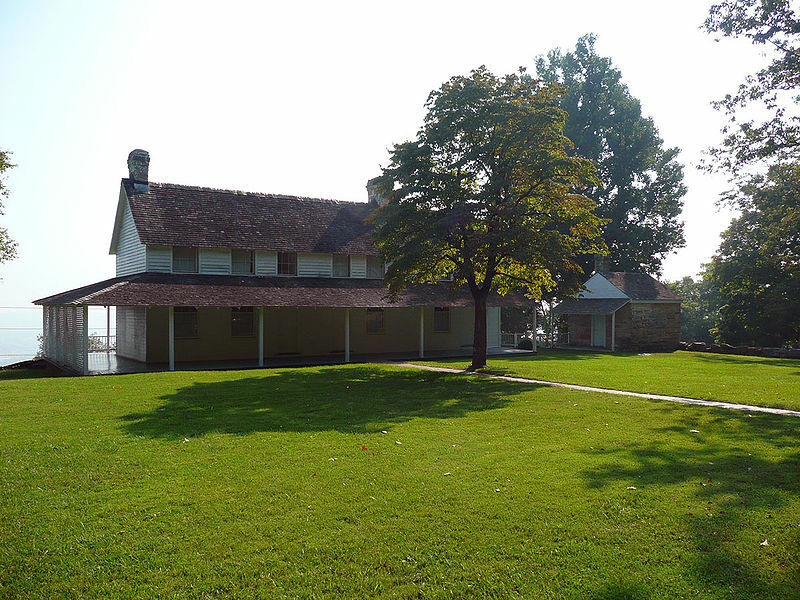 They marched through the mist for almost three miles behind a New York Brigade under Colonel David Ireland, whose troops along with other units cleared much of the western bench of Confederates, before rounding the point of the mountain and stalling at a Rebel position located at a homestead known as the Craven’s House. As the fighting intensified, the moment of action had arrived for Whitaker’s Brigade and the 35th Indiana. They had been subjected to sporadic fire from skirmishers and Confederate sharpshooters on the summit during their long march, and now the opportunity had come for them to fully engage the enemy. After 1pm Whitaker’s Brigade reached Ireland’s positions at the Craven’s House and yard. After pausing momentarily, Colonel Mullen sent his men in shouting ‘Up bullies with a cheer! Charge at a run! Steady! Steady! Thirty- fifth!’. The troops roared ‘Faugh-a-ballagh!’ (Clear the Way) and sprang forward (2). Mullen ordered the charge as he felt he could not preserve an ordered line under the severe enemy fire. The men entered the first set of enemy works successfully without firing a shot. After a short pause they charged once again and secured the Confederate’s second line. The Irishmen captured a number of prisoner’s and secured two piece’s of enemy artillery, with the latter being turned over to the 40th Ohio (3). General Whitaker then instructed the Irish to hold what they had gained; Mullen ordered Sergeant Jim Somers, the Regimental Color Bearer, to plant the flag on the enemy works. The 41st Ohio passed through the 35th Indiana’s line to keep up the pressure on the Confederates. The foggy conditions on the mountain now reduced visibility to almost nothing, and both sides settled down to trading shots in the mist. As evening approached the 35th again moved forward to the front, relieving troops who had run out of ammunition. The Irishmen in turn expended their ammunition in firing at the invisible foe, and another unit moved up to replace them and hold the line. Their fighting completed for the day, Mullen and his men settled down for the night on the ground they had won. The Confederates had no wish to renew the fight the next morning, as their position had now become untenable. They pulled their troops out during the night. The following morning the flag of the 8th Kentucky, part of the same Brigade as the 35th, flew from the summit of Lookout Mountain. 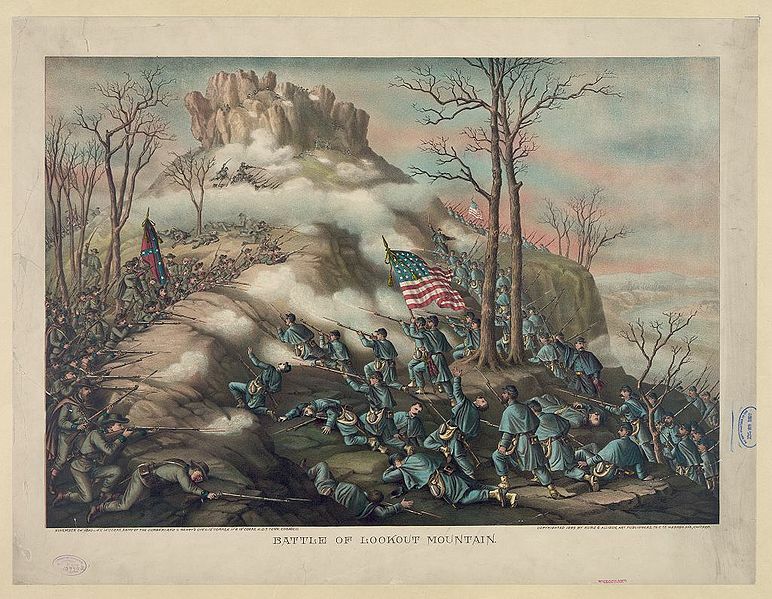 The Irishmen went on that day to assist in the assault on the main Confederate positions on Missionary Ridge, which completed the defeat of the Army of Tennessee, and opened the door for an advance towards Atlanta. The 35th Indiana’s part in the ‘Battle Above the Clouds’ was a significant one. They escaped with relatively few losses (they suffered 10 men wounded during the Chattanooga battles), though Captain James Fitzwilliams of Company G was shot through the arm and Private James Kearns of Company A was shot through the lungs. Mullen singled out Major Dufficy, Adjutant Gallagher, First Lieutenant John Maloney and Sergeant-Major John Powers for their conduct during the attack. Ah! So I was not the first Gallagher on that mountain! It is a most impressive location – towering high above Chattanooga. You may be interested to know that the memorial there is , I believe, the only American Civil war monument to portray both Confederate and Union soldiers – they are shown shaking hands atop a very tall pillar.